I may have mentioned that sometimes I go to Sydney for work. It's a lovely job perk, to go hang out in Summer weather in January, explore another city, and eat many things served on wooden boards. The unfortunate part is that the Sydney office is far superior to our SF office, in many ways, but especially in the breakfast department. In our office, we have bread and jam and a toaster, and cream cheese as long as the leftover supply from Bagel Monday holds out. Inexplicably, though, there is never any butter. In Sydney, they have about 5 kinds of butter, jam, and a variety of bread options, from plain, to thick cut cinnamon raisin toast, and sometimes, crumpets. The crumpets are the ones that really get me. I LOVE them. 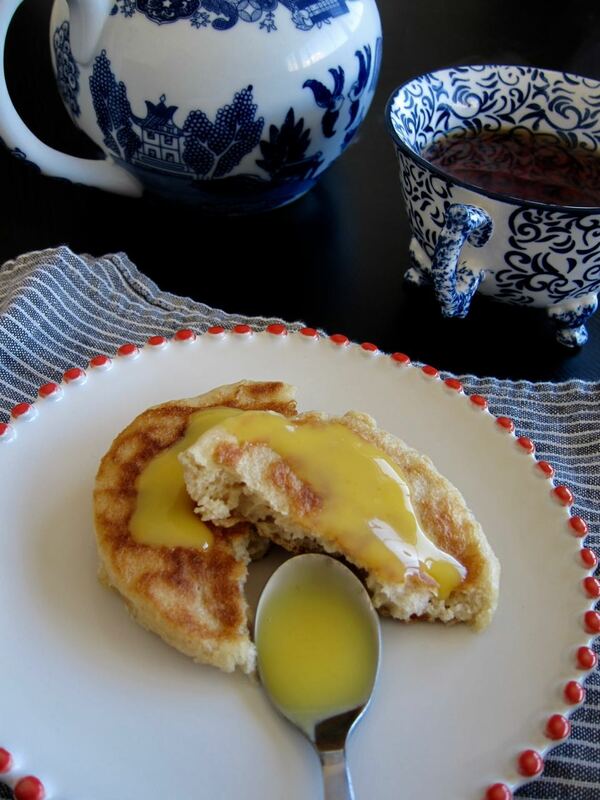 Think of an inside out english muffin, but richer, and one that has all its nooks and crannies on the outside. Throw one of those in the toaster and spread on some butter and it melts all into the cracks and crevices. It's divine, even the obviously commercially produced ones in the office. Since crumpets aren't exactly a thing here in the US, it's kind of hard to relive the experience at home. So I decided to make them! The result was not exactly what I was remembering, but close enough to satisfy any cravings until my next trip to Sydney. I guess I'll need to make another batch to get me to 2019! In a bowl of a stand mixer, combine milk, sugar and yeast and let stand 10 minutes until slightly foaming. Mix in the flour and salt with the paddle attachment, and then beat for 3 minutes on high. Cover with a towel and let rise until doubled in size, 1 hour. Mix the water and baking soda together and then beat into the dough with the paddle attachment. Heat a skillet or pan over medium heat, and brush with oil. Oil round biscuit cutters or tart rings or whatever round, heat-proof tool you are using (I found regular cooking spray to work best for creasing both the pan and the rings). Place rings on the skillet and fill with batter, just enough to cover the bottom if you are using biscuit cutters (a little less than 1/4 cup batter). 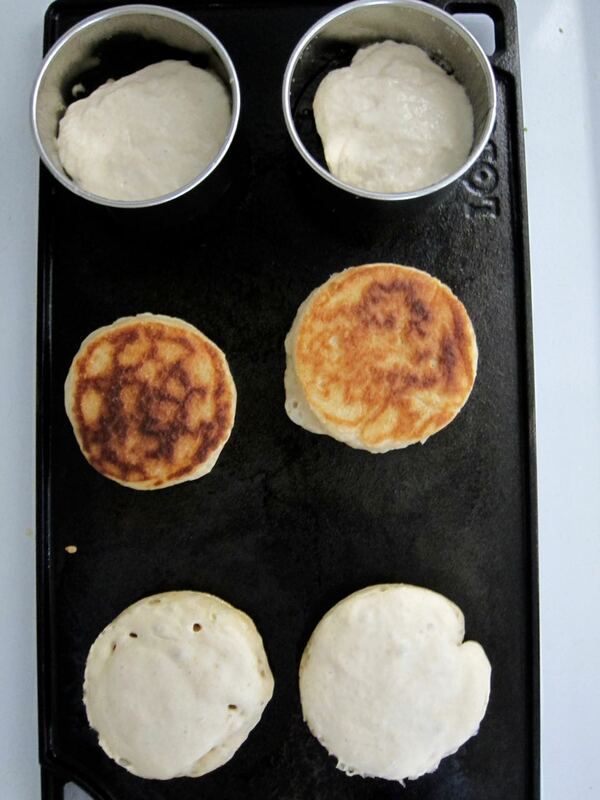 Cook the crumpets until bubbles begin to appear, then gently lift off the cutters or rings with tongs and continue to cook about 4-5 minutes, making sure bottoms aren't browning too much. Flip, and continue cooking on other side until golden brown. Transfer to a rack to cool. Repeat with remaining dough.